The number one question we get: Does the Microbiome Test indicate if my pet is healthy or not? What makes a micriobiome healthy or not continues to be a maturing science, and one AnimalBiome works on diligently. In general, more species (species richness) and higher diversity indicates better health, while fewer species and lower diversity indicates poorer health. We are studying the data from your pet and the rest of our customers to bring you the best recommendations for how to help you improve your pet’s health. You can see how your pet compares to other cats or dogs in our database for its diversity value at the bottom of your pet’s results screen. 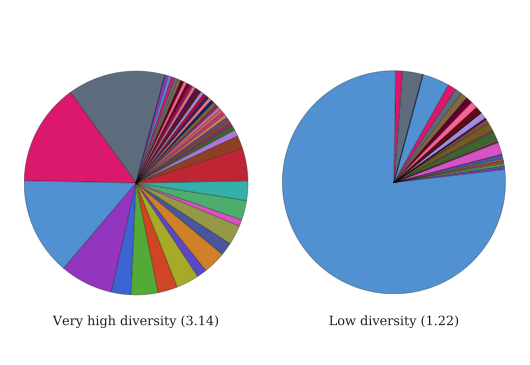 The diversity value we calculate indicates how abundant each bacteria type is, or how evenly distributed the bacteria are. If your pet has one very dominant strain, this could indicate a problem. Even though the samples both contain the same number of different types of bacteria, bacteria in the sample on the left are more evenly distributed and thus more diverse. These example pie charts are showing the genera in two animals and are comparable to the outer ring (the genus level) of your pet’s results in the Pet Portal. A microbiome is an ecosystem; each microbe has a specific job to do helping your animal digest and process their food. It can be described in ecological terms – more species and more diversity generally means a healthier, better functioning ecosystem, just like a rainforest. However, the relationship is not completely cut and dry – sometimes low diversity animals are still healthy, while high diversity animals are sick. Your pet may have a low diversity microbiome and not have any ill health symptoms. The concern for this scenario is that this microbiome may be less resilient in the face of a course of antibiotics or an illness. If they have a high diversity microbiome but have symptoms of gastrointestinal distress, this indicates that the microbiome may be out of balance - that some of the microbes may be doing too much of one job while others are not getting done at all. The microbiome is a microbial community (bacteria, fungi, viruses and other tiny things) occupying a discrete habitat, like the gastrointestinal (GI) tracts of cats and dogs. We are just beginning to explore the roles microbes play in maintaining the health of our pets. The GI tract of domestic pets supports a diverse bacterial community that directly influences pet health and nutrition. The duodenum (the part of the gut that the stomach empties into), for example, can harbor up to 100 million cells per gram of poop, and is dominated by bacteria that live in environments with low levels of oxygen. Like most mammals, including you and me, dogs and cats are colonized by bacteria during delivery and birth. Upon birth, animal moms begin licking their babies, passing them more microbes. Once exposed to the outside world, animal microbiomes are altered by all they interact with and eat, so that their microbial communities show dramatic changes in species composition and structure during weaning from mother’s milk to the digestion of a high protein diet, whether prey, kibble or can. In addition to diet, evolutionary history affects the composition of the gut microbiome. For example, a study of gut bacteria in a wide range of mammals found that both diet (herbivore, omnivore, and carnivore) and taxonomic grouping of the mammal (such as orders: primates, insectivora, and carnivora) influence bacterial diversity patterns. The order Carnivora is a taxonomic grouping that includes cats and dogs and contains many omnivores (such as dogs, bears and raccoons), some herbivores (like pandas), as well as strict carnivores like cats. Bacteria taxonomically belong to the Kingdom Bacteria. The main lineages within a kingdom are called phyla. The bacterial phyla Firmicutes, Bacteroidetes, Proteobacteria, and Actinobacteria are common phyla found in the gut microbiome. Firmicutes is a phylum containing the classes Clostridia and Bacilli; many Firmicutes produce drought-resistant spores and are able to survive extreme conditions. Firmicutes are thought to more efficiently extract energy from food compared to other bacterial groups. In people, obesity has been found to correlate with an increased proportion of Firmicutes and a decreased proportion of Bacteroidetes in the gut microbiome. A recent study found that the relative proportion of Firmicutes and Bacteroidetes in the human gut microbiome varies with latitude and may reflect human evolutionary history, where people living in higher latitudes needed to have higher digestive efficiency and greater body mass. Bacteroidetes is a phylum composed of three large classes of bacteria that do not form spores and are widely distributed in the environment, as well as in the gut microbiome and skin of animals. Two well-known genera in Bacteroidetes are Bacteroides, which occurs commonly in animal feces, and Porphyromonas, which inhabits the oral cavity. Proteobacteria is a major phylum of bacteria that includes well-known taxa such as Escherichia, Salmonella, Vibrio, Helicobacter and Yersinina. Although we are still determining what is normal for cats and dogs, an increased proportion of Proteobacteria in the gut microbiome of humans is associated with chronic inflammation and colitis and may be a sign of a dysbiosis. Actinobacteria is a large phylum that contains many bacteria that live in soil and freshwater and play important roles in decomposition. In addition, members of the genus Streptomyces sp. are important sources for antibiotics and other bioactive molecules. Learn more about some of the other common bacteria we encounter in samples from cats and dogs. Please also take a look at our blog, which has some more posts about the gut microbiome and pet health. Questions? Please email us at team@animalbiome.com. If your questions are about your pet's assessment, it helps if you can share it with us so we can see what you are seeing. Your results are private by default, so you will need to unlock them. Simply click the lock icon on the upper part of the screen, then send us the link to the page in your email.